St Petersburg sport bars are great places to catch the live action of your favorite team. There are plenty of sports bars in St Petersburg where you can cheer on your favorite football team or simply grab a drink over some rugby, hockey, or cricket. If like Russians you love sport, then you won’t be disappointed! From dedicated football pubs and those showing worldwide sporting events to more relaxed bars in hotels, the Imperial city has something for everyone. As soon as you step inside you'll find giant screens, projectors, sports memorabilia and a sports-mad crowd. If when you're in the city you’re searching for a good venue to watch your favorite sport team with Russian fans and want to sip Guinness, Paulaner, Augustiner, or just taste a Russian beer, then check out our favorite list of St Petersburg sport bars below. Below a list of most popular St Petersburg sport bars for an awesome evening with friends or even on your own. Situated on the University Embankment this sports bar is the place to come to enjoy a beer and great snacks while watching your favourite sport. Multiple screens ensure you won’t miss any action, and if you’re hungry the food menu is comprehensive. You can play a range of bar games too. The modern stylish interior is welcoming and when the weather is good there’s a terrace overlooking the Neva River. Street Food Bar No. 1 is open daily from 8 am to midnight. As you’d expect from a sports bar, Rugby House Pub has a range of rugby memorabilia adorning the walls and show cabinets. The bar provides coverage of all live sport and offers promotions at the bar. For instance, “order 2 glasses of stout and get another one free”. The food menu, available from midday to 5 pm weekdays, is really good and caters for fitness fanatics too. This is the only pub in Russia that is dedicated to Rugby. The pub is open from 11:30 am to midnight (1 am on Fridays and Saturdays). "Great Pub on Nevsky Open All Hours"
Tower Pub never closes. It’s in the style of a traditional English pub with a nod to the Beefeaters at the Tower of London. Tower Pub specialises in beers and they have 28 different draft beers, as well as 24 different varieties of bottled beers. In addition, they offer a fine selection of whiskeys and cocktails too. Sports fans can watch top sports matches on the big screen and if you’re hungry you can enjoy a fine selection of food from snacks, to steaks, salads, pasta, or desserts. "One of Our Favorite St Petersburg Sport Bars"
Bruxelles Pub offers more than 100 beers in the Belgian gastronomic pub style. 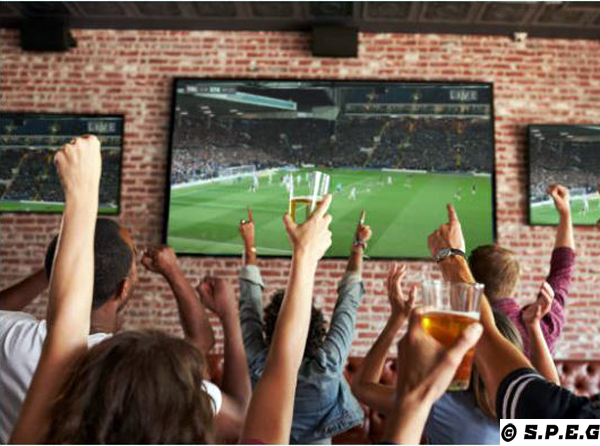 Open daily from midday to 2 am this is the place to come to see sport on the big screen, or just to enjoy the pleasant surroundings while sampling some fine beers, wines or spirits. Bruxelles Pub is part of the Italy Group of restaurants and offers an extensive menu to cater for all tastes. If you can’t decide what to choose from the menu, you can try one of three degustation sets – you won’t be disappointed! Bar 17 is the place to visit if you’re a fan of sports, but particularly ice hockey. The bar covers all the local and international matches, and you can follow every move while enjoying great beer and burgers or homemade sausages. The menu changes daily, and food is served from 1 pm to 5 pm so you can enjoy a long lunch! This is the place to come and join other fans and cheer on your team. The staff are friendly and helpful and the atmosphere is electric when a great game is being played.